Created for visually lossless extension of DisplayPort signals, IHSE has launched a new extender series: the Draco vario DisplayPort extenders. These are compatible with Draco tera KVM matrix switches and are cross-compatible with the DVI and HDMI extender series for video and USB-HID extension. Transfer of fully-digital video signals (including 3D video in HD) is supported in 4K resolution up to 4096×2160 and 3840 x 2160. The DisplayPort extender supports digital audio standards. This eliminates the need for additional audio modules, enabling playback of the audio signal through monitors with integrated loudspeakers. 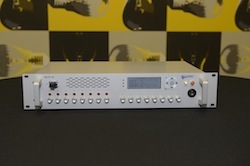 Integration of optional upgrade modules for digital audio input and output is also possible. IHSE offers DisplayPort extenders in single and redundant path variants. Various upgrades to extend legacy video standards and convert analog signals are also available.